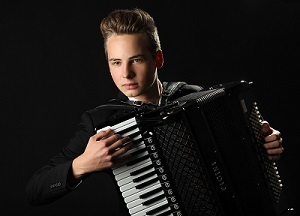 Julius Schepansky, was born in 1998 in Lünen near Dortmund and started playing the accordion at the age of seven. From 2006 to 2014 he was taught at the music school in his hometown until he became a student at the college of music in Münster in 2014 where he is a student of Prof. Claudia Buder. Since 2008 Julius participates successfully as a soloist and in changing chamber music ensembles in national and international competitions such as “Jugend musiziert” or “Internationaler Akkordeonwettbewerb Klingenthal“, gaining many different awards as in 2012 the “Wolfgang Jacobi Award“, in 2013 the award of “Deutscher Akkordeonlehrer-Verband” and the award of “Deutsche Stiftung Musikleben“. At the WESPE in 2013 he was awarded by the Federal Ministry of Family Affairs, Senior Ctizens, Women and Youth for the best interpretation of a work by a female composer: “de profundis“ by Sofia Gubaidulina. In December 2014 Julius and colleagues were invited to play in Japan, for example at the Goethe Institute Tokyo. Beyond that he played the accordion part in the premiere of the opera “The amputation of Charlie Sharp“ with the North Rhine-Westphalian Youth Plucked String Orchestra. Julius is also activity composing, again winning awards: in cooperation with colleagues he presented their piece “Tactless Triangle,“ in Münster in 2015. In the same year at the WESPE, the “Neue Musikzeitung“ (nmz) and the „Verband deutscher Musikschulen“ (VdM) awarded his piece “Tuokio,” an improvisation developing in the moment of playing. Personally Julius is interested in contemporary music and improvisation, including music unfamiliar to the accordion: For his interpretation of swedish folkmusic and swedish pop music by ABBA he was given the first prize of “Achterkerke Stiftung“ during the youth music festival in Usedom & the invitation to play a concert during the “Usedomer Musikfestival“ in 2017. Since 2008, Julius is also playing the piano. Besides classical music he plays jazz and in a Big Band, being taught by famous teachers such as Milan Svoboda, Misha Tsiganov, Pablo Held and Hans Wanning. As the pianist of the East West European Jazz Orchestra he played concerts in Rostov on Don, Russia and in Prague, Czech Republic. Founding the Julius Schepansky Quintet in December 2015 they were the winner of the Jazz band challenge being part of the 30st international Jazz-festival Viersen. The prize included a concert broadcasted on TV. The quintet, which plays jazz standards, own compositions and arrangements of different music styles for example of the japanese folksong “Sakura“ also performed during the international Jazz-festival Prague in 2016. You can listen to Julius here. If you are interested in working with Julius, please get in touch with the EMCY Office.